Line A Tub in Bloomfield, NJ is a kitchen cabinet and bathroom makeover company. Applied Liner Systems™ has been developed by a family owned and operated business, R & R Refinishing, Inc. a/k/a Line A Tub has been operating for over 55 years. We are the original on-site kitchen cabinet and bathroom makeover Company. Our motto is "Do it once do it right"! Line A Tub Applied Liner Systems™ forms a one piece acrylic shell over your existing tub, tile and sinks. This process gives superior strength and durability to your fixtures. Our Line A Tub Applied Liner Systems™ have been tried and tested under the most severe conditions and have passed all strength and durability tests with flying colors. This system is the finest on the market today. Epoxy, other reglazing systems and paint-like finishes can leave you with a messy peeling tub, which will be costly to repair. approx. 2 days (most jobs). 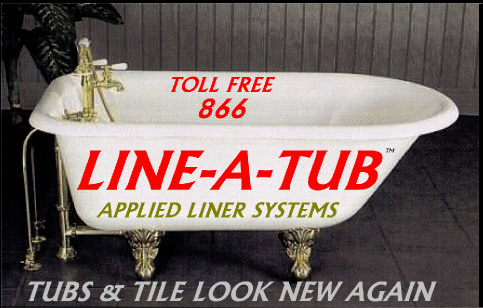 Line A Tub Applied Liner Systems™ is a fraction of the cost of those manufactured tub and wall liners. warranty with a prorated fee of $65.00 per year. Slip Resistant Surfaces – Do You Need a Non-Slip Surface for Your Bathtub or Shower? Line A Tub offers a slip resistant surface for bathtubs and shower pans. It will not only help reduce the risk of slip and fall but is also sanitary and easy to clean. Porcelain Tub Refinishing - Is Your Porcelain Tub Dull or Hard to Clean? With everyday normal use, the original porcelain finish on your bathtub can becomes dull, porous and hard to clean. Continued use of abrasive cleaners, like Comet, can even more quickly degrade the surface. Porcelain bathtubs can also be easily cracked or chipped. We can even change the color of your tub to compliment any decorating plan. The compelling reason to refinish your bathtub is that you can save up to 50% over the cost of replacement. Apart from bathtub, tile and sink reglazing, Line A Tub also offers wood, metal and formica cabinet refinishing services. Our trained professionals use high quality materials to make your kitchen cabinets better than new. You’ll be amazed at the difference in the overall look and appearance.